Today we’re honoring June’s official birthstone – the lovely pearl — by bringing you a glimpse of a rare ancient fossil 10 times the size of an average oyster that is likely concealing an extraordinary treasure – a natural pearl the size of a golf ball. 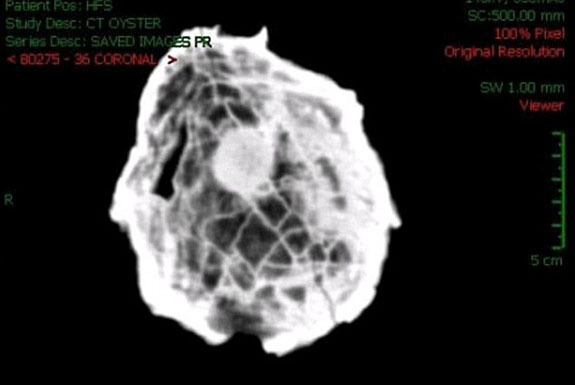 The seven-inch fossilized oyster, which is estimated to be 145 million years old, was scanned with sophisticated MRI equipment that revealed the presence of a round, smooth object that could be a giant pearl. 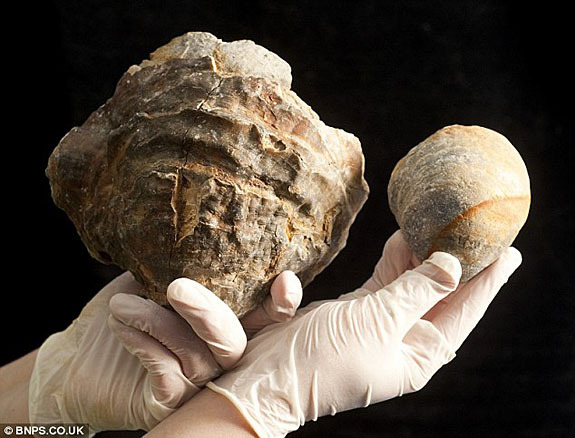 This mammoth oyster reportedly turned up in the Solent, a strait separating mainland England from the Isle of Wight. The rare specimen is currently housed at the Blue Reef Aquarium in Portsmouth, UK, where it is seen only at lectures. 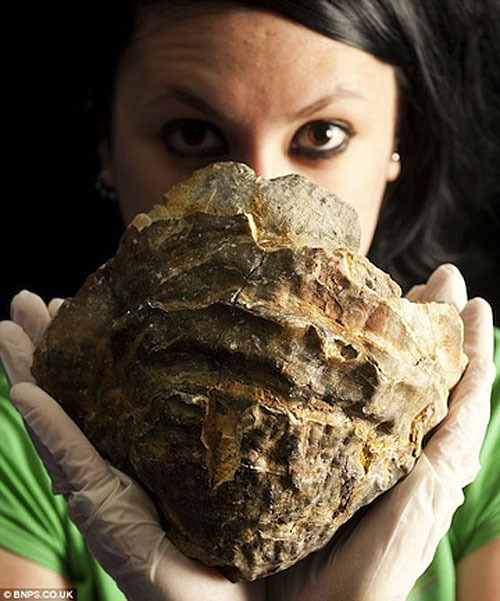 Aquarist Jenna MacFarlane from the Blue Reef Aquarium holds the gigantic oyster that could contain a huge natural pearl. If the object inside were removed and identified as a pearl, it could be priceless – but it would mean destroying the rare fossil, which is an unacceptable trade-off for Holloway and her team. Natural pearls are formed inside the shells of bivalve mollusks as a defense mechanism against an irritant. The mollusk secretes layers of nacre (calcium carbonate) to seal off the irritation. This secretion process is repeated many times, producing a iridescent pearl. Natural pearls come in various shapes, with perfectly round pearls being the most rare. 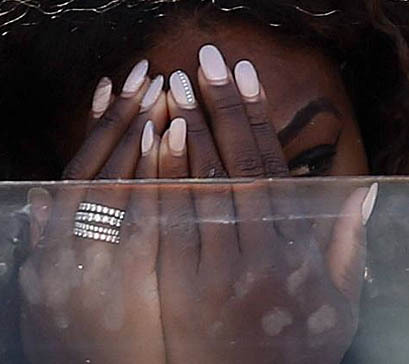 Top-ranked tennis pro Serena Williams, a beautiful and stylish athlete who has never been shy about wearing plenty of bling during her matches, sought the help of a trainer when her stacked diamond bands were chafing the pinky finger on her right hand just before the French Open quarterfinals on Tuesday. Instead of removing the rings, Williams decided to sacrifice comfort for style. The trainer applied ointment and tape to what Jon Wertheim of the Tennis Channel called a “bling blister,” and Williams was good to go. Despite being down 2-0 in the third set to unranked Svetlana Kuznetsova, Williams amassed a strong comeback and is now poised to move on to the French Open semifinals for the first time since 2003. She’ll be matched up against No. 5 seed Sara Errani of Italy. An older photo of what seems to be the same ring confirms that the jewelry at the center of our story is really a stack of four diamond bands, each one slightly different than the other in width and diamond size. When it comes to looking fabulous on the tennis court, the world’s No. 1 female tennis player would never let a little blister get in her way. She’s often seen in huge dangling earrings, bold diamond rings, handcuff-style bracelets and stylish pendants. And, yes, the nails are always long, colorful and perfectly manicured. 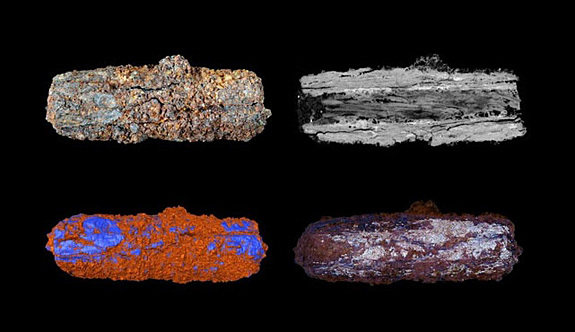 This rusty tube-shaped bead may not look very impressive, but its chemical composition reveals that it was part of a meteorite that ancient Egyptians crafted into iron jewelry more than 5,300 years ago. Egyptians of 3,300 BC probably believed that the sky-born metal was a gift from the gods, according to scientists from the Open University and the University of Manchester, who studied the artifact using an electron microscope and X-Ray CT scanner. A chemical analysis revealed that as much as 30 percent of the metal inside the bead was composed of nickel, which strongly suggests a celestial origin. Nickel-rich iron wouldn't appear in Egypt until thousands of years later during the Egyptian Iron Age. The scientists also created a 3D model of the bead's internal structure, which revealed that the ancient Egyptians created the ornament by hammering a fragment of iron from the meteorite into a thin plate and then bending it into a tube. Their findings were published in the May 20 edition of Meteoritics & Planetary Science. The bead studied by Tyldesley and her team was one of nine metal tube-shaped beads that were first excavated at the Gerzeh cemetery near Cairo in 1911. The iron beads' inclusion in burials suggests this material was deeply important to ancient Egyptians, perhaps ensuring the deceased a quick journey to the afterlife, the scientists suggested. In 1928, scientists studying the composition of the beads first suspected their cosmic origin. They determined that the nickel content was unusually high—the signature of iron meteorites. But then in the 1980s, other scientists countered that the nickel-rich material could have resulted from early attempts at smelting. The latest data puts an end to the mystery. 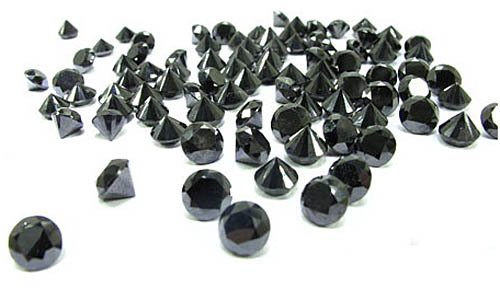 The bead demonstrated a distinctive crystalline structure called a Widmanstätten pattern. This structure is found only in iron meteorites that cooled extremely slowly inside their parent asteroids as the Solar System was forming. The beads are currently part of the permanent collection of University of Manchester’s Manchester Museum. Originally released in 1996 as the lead single off the group’s Trial by Fire album, “When You Love a Woman” quickly ascended to #1 on the Billboard Hot Adult Contemporary chart and topped out at #12 on the U.S. Hot 100. In 1997, the song earned a Grammy nomination in the category of Best Pop Performance by a Duo or Group. Former members of Santana and Frumious Bandersnatch formed Journey in San Francisco in 1973. After a long string of hits, the group disbanded in 1987 only to reunite in 1995. When lead singer Steve Perry went down with a hip injury and was unable to tour in 1998, the group made numerous — and mostly unsuccessful — attempts to fill Perry’s very big shoes. 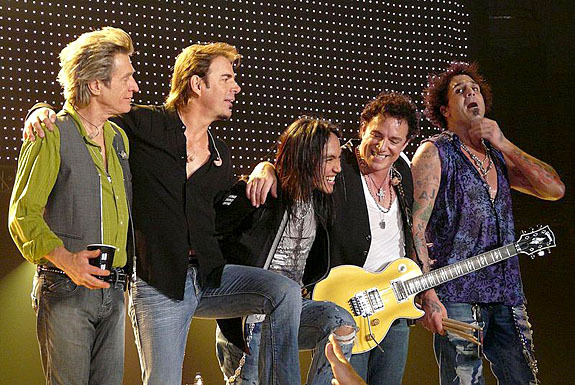 Finally, in 2007, original band member Neal Schon was viewing Journey covers on YouTube when a video by Filipino Arnel Pineda caught his attention. Pineda had a golden voice similar to Perry’s and Journey had their man. He has been singing lead vocals for Journey ever since. We invite you to enjoy the video at the end of this post. It’s Pineda’s interpretation of “When You Love a Woman.” The lyrics are below if you’d like to sing along. Set with 243 diamonds and tipping the scales at a hefty 380 grams (more than three-quarters of a pound), the Baltimore Ravens’ Super Bowl XLVII rings are over-the-top in every way. Members of the 2012 team, which beat the San Francisco 49ers 34-31 to capture the franchise's second championship, received their impressive bling on Friday night during a private ceremony at the team’s training complex. 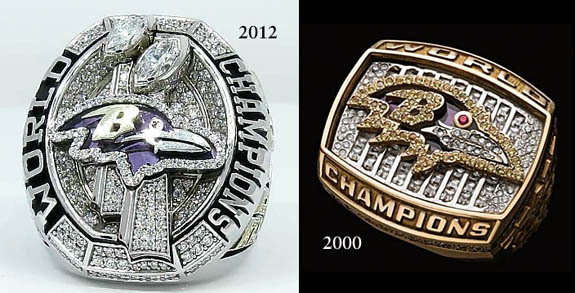 The 2012 ring is far bigger and more ornate than the one designed for the team in 2000. 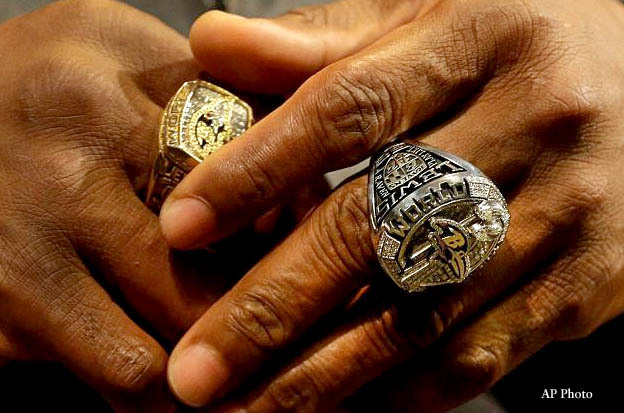 Wearing the 2012 ring on his left hand and the 2000 edition on his right, recently retired all-star linebacker Ray Lewis told the Associated Press: "There's no better way to go out. I can hold this the rest of my life and know I went out as champ." While acknowledging the symbolism behind the ring, Super Bowl MVP quarterback Joe Flacco tried to wrap his head around the practical side of showing it off. "It's kind of un-wearable," he joked. Designed by Jostens with the help of team owner Steve Bisciotti, Flacco and Lewis, the 10-karat white gold ring has yellow gold accents and a diamond total weight of 3.75 carats. 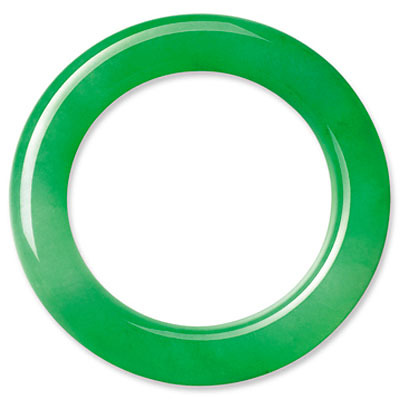 The face of the oval ring looks like a diamond-encrusted stadium adorned with the symbols of both the Ravens and the National Football League. The Baltimore Ravens’ logo is outlined with 40 round brilliant-cut diamonds, and the stylized “B” stands out in contrasting yellow gold as it sits atop a custom-cut purple amethyst stone. The beak of the raven is designed in white gold and the eye is colored in red enamel. Since this is the team’s second championship, two Vince Lombardi Trophies adorn the face of the ring. 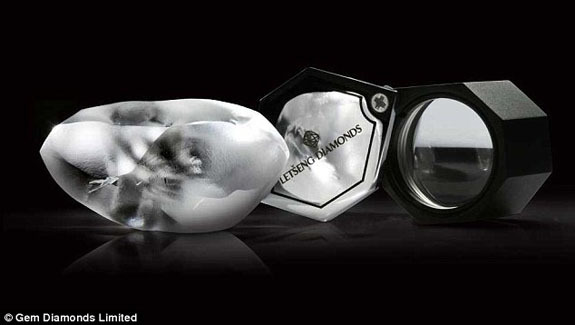 The trophies are topped with .75-carat marquise-cut diamonds that mimic the shape of a football. The words "Word Champions" surround the left and right border. On the left side of the ring is the player’s name in white gold against a ground of black enamel. Below the name is the Ravens’ shield, along with the team slogan, “Play Like a Raven.” Below the shield is the player’s number. On Flacco's ring, it says "MVP." The right side of the ring features the year 2012 in yellow gold, accented with 39 round diamonds. Below the year is the official Super Bowl XLVII logo. Engraved inside the ring is the team’s mantra, “The team. The team. The team,” as well as the scores of the four playoff games that the Ravens won to earn their championship. The logo of the opponent is next to each score. The football-sized Millennium Sapphire, a gem carved with the likenesses of famous historical figures, is available for sale if the right buyer can come up with $180 million and promise that the 61,500-carat marvel will be housed where the public can view it on a regular basis, according to The National. Designed by Italian artist Alessio Boschi, the Millennium Sapphire was conceived as a tribute to human genius and includes 134 subjects, including the faces of Beethoven, Michelangelo, Shakespeare, Albert Einstein and Martin Luther King. It also features representations of the Pyramids of Giza, the Great Wall of China and Gutenberg’s printing press. A consortium of investors led by Daniel McKinney owns the Millennium Sapphire. Over the past 15 years, the impressive carved sapphire has been on public display only twice — in 2002 during the Academy Awards and two years later for the maiden voyage of the Sapphire Princess cruise liner. Otherwise, it has been tucked away in a safe in an undisclosed U.S. location. Recently, the consortium agreed that amazing work needed to be enjoyed by the public. The owners opted against putting it up for auction, because they couldn’t control who the buyer would be. 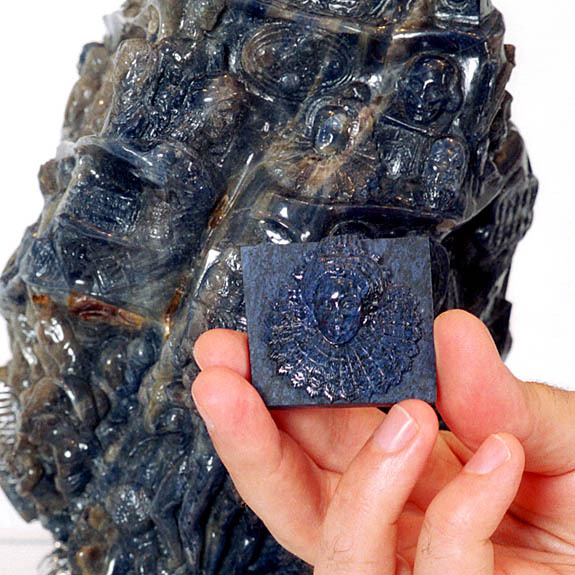 The 28 cm (11 inch) Millennium Sapphire was unearthed in Madagascar in 1995. 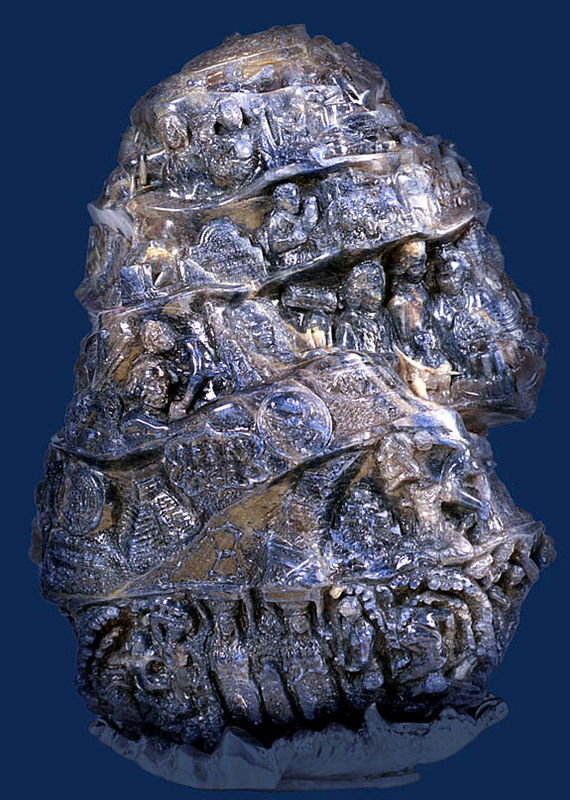 It weighed about 90,000 carats in its rough state and lost about a third of its mass during the carving process, which took two years and was completed in 2000. 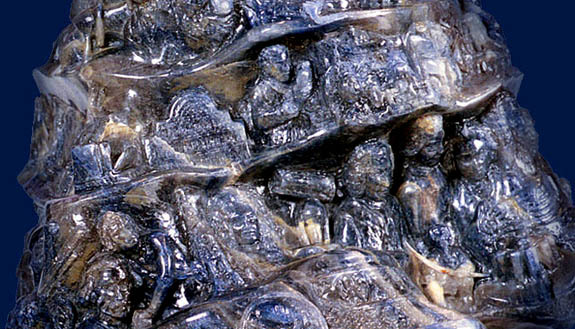 Before the carvers set to work, they practiced by producing each of the 134 design elements on pieces of lapis lazuli. 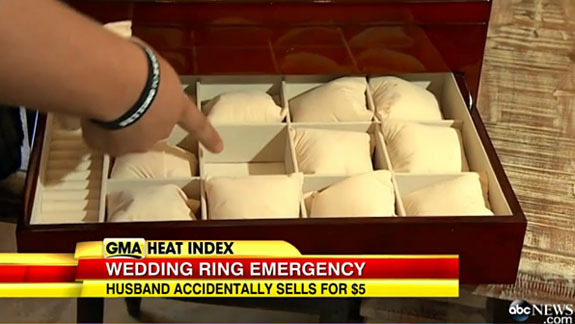 When it comes to selecting the perfect engagement ring, most guys are no longer on their own. A new survey by WeddingWire.com reveals that nearly 70% of brides have input in the buying decision. When asked about the specific features of a ring, brides selected style over size. More than 86% of brides said the “overall design” was one of the most important features of a ring. This answer topped all others, including price (62.7%), color of the diamond (58.5%), sentimental nature of the ring (58.3%) and size of the diamond (47.7%). The question, “How did you select your ring?” revealed a “disconnect” between the sexes. Brides rated the “setting” (55.7%) above the “type of stone” (22.6), while their partners believed the opposite — the “type of stone” (50%) was of greater importance than the “setting” (20%). Round and princess-cut diamonds were, by far, the most popular choices of engagement ring center stones. Nearly half (46.8%) are flaunting their "round" diamonds, while 31.5% are enjoying their "princess" cuts. Further down on the list were "cushion" (5.5%), "emerald" (3.6%) and "marquise" (3.6%). The survey also revealed that chivalry is still alive. 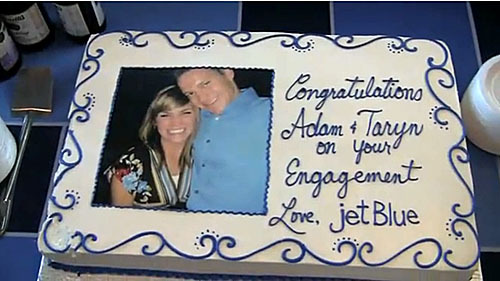 Exactly 80% reported that their partners paid for their engagement rings. 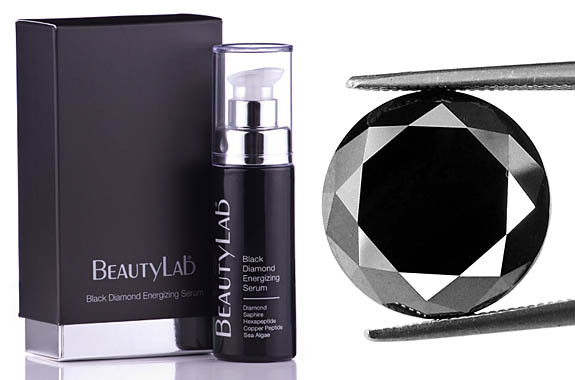 Finely ground black diamonds are the key ingredients in London-based BeautyLab’s new anti-aging serum that diffuses the light to give skin an airbrushed, youthful look. BeautyLab’s managing director Roger Aoun explained that the black diamonds absorb visible light and convert invisible UV light into blue light, which is scattered across the surface of the skin. The result is the soft diffusion of light that gives the user an airbrushed look. Gemstones in beauty products are "a bit of a Hollywood secret," said Rachel Scaperotta, a beautician at the Beverly Wilshire hotel spa. "It's a pretty instant effect," she told Today. "That's why celebs like it." In addition to black diamonds, the serum contains sapphires, hexapeptide, copper peptide and sea algae. The peptides stimulate the creation of collagen, resulting in plumper, smoother and more radiant-looking skin. The serum is priced at $120 for a 30ml bottle. The companion lotion is $140. The brand new product is already a hit in the U.K., where it was launched a few weeks ago. The pre-launch waiting list topped 4,000. In clinical trials, 1,000 women using the black diamond serum reported a 65% reduction in fine lines and wrinkles in just 28 days. Welcome to Music Friday when we bring you awesome songs with jewelry, gemstones or precious metals in the title or lyrics. Today we feature one of the finest rock guitarists the world has ever known. It’s Eric Clapton performing “Diamonds Made From Rain,” with backing vocals provided by Sheryl Crow. Using both diamond and pearl metaphors, Clapton sings about emotional redemption and his path to personal enlightenment in this bluesy track from his self-titled 2010 studio album. Interestingly, Clapton invited his former love interest, Crow, to collaborate on “Diamonds Made From Rain.” The pair apparently had a brief relationship in the late 1990s and it is rumored that her song, “My Favorite Mistake,” is about him. 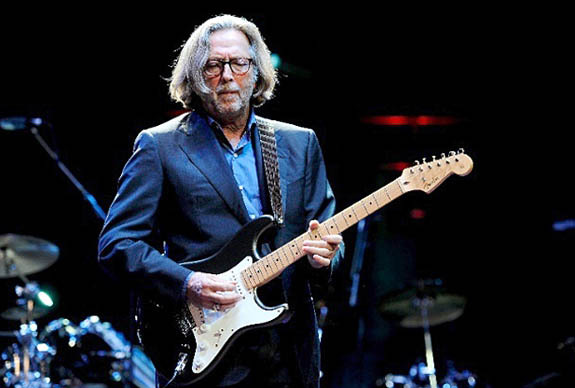 The 68-year-old Clapton has sold more than 129 million albums during his 50 years as a performing artist. We invite you to enjoy the video at the end of this post. The lyrics are below if you’d like to sing along. Written by Doyle Bramhall II, Nikka Costa, Justin Stanley. Performed by Eric Clapton, with Sheryl Crow. 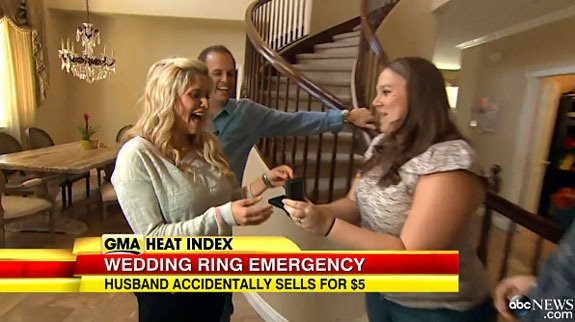 A two-week nightmare is finally over for a well-intentioned, but bumbling, husband who accidentally sold his wife’s $23K diamond engagement ring for $5 at his neighborhood’s annual garage sale. 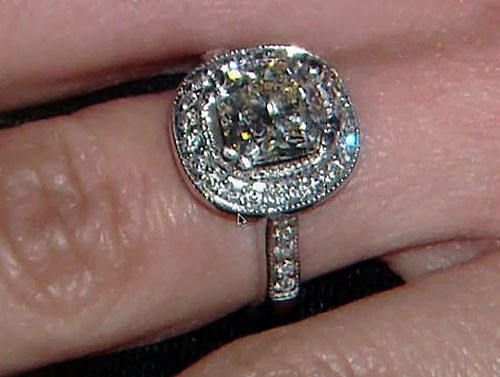 After seeing media reports about the lost ring, a super-honest couple came forward on Thursday to return the 3-carat sparkler that had been hidden beneath a pillow compartment of an old watch box. June 1 was a busy day for the Cloutier family. Mom Racquel had just given birth to her fifth child and dad Eric zipped home from the hospital to participate in the community garage sale with the rest of his family. Eric scoured his house to find the right item to contribute to the sale and came up with a rarely used watch box from his closet. Eric planned to sell the seemingly empty box for $10, but settled for $5. It turns out that the woman who made the deal then gifted the box to her daughter and son-in-law, Andrew and Alyssa Lossau. When Racquel returned from the maternity ward she discovered that the watch box and her ring were gone. Racquel had taken off the ring and hidden it in the box days before she entered the hospital because her fingers had swollen due her pregnancy. "It wasn't until that Tuesday [June 4] that I thought to put my ring back on,” Racquel told The Daily News. “I didn't see the box." Then Eric told her that he sold the box at the garage sale. 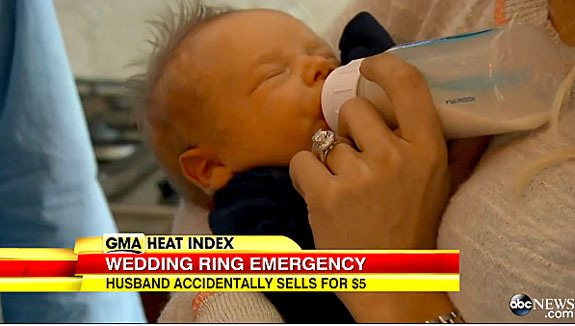 She began crying, "You just sold my wedding ring!" The couple turned to the media for help. Their compelling story went viral and was soon picked up by high-profile outlets, such as The Daily News and Good Morning America. The Lossaus from nearby Mission Viejo, Calif., saw the report and contacted the Cloutiers. 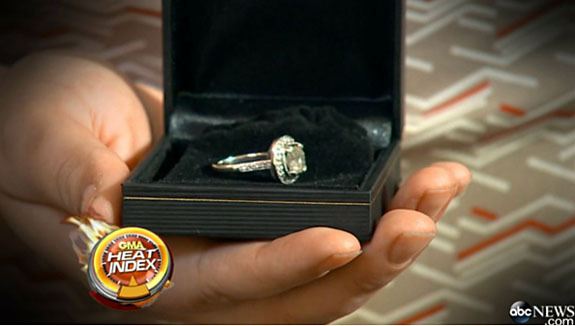 On Thursday, the couples met in the heartwarming return of Racquel’s engagement ring. "I couldn't believe that my ring had come back to me. They really found it!" Cloutier told The Daily News. The Cloutiers said they would make a donation to the Lossaus’ favorite charity to acknowledge their honesty and kindness. 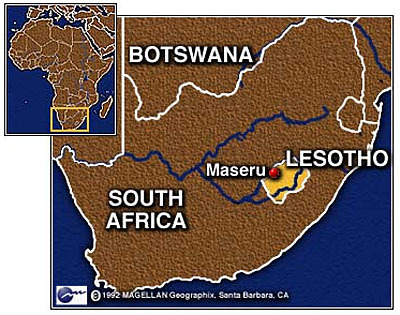 Completely surrounded by South Africa, its only neighboring country, the diminutive Kingdom of Lesotho is a world-class powerhouse when it comes to producing large, top-quality diamonds. Five of the 20 largest gem-quality white diamonds ever recorded were unearthed at Lesotho’s Letšeng mine — a mine that consistently yields the highest per-carat value of any kimberlite diamond mine in the world. 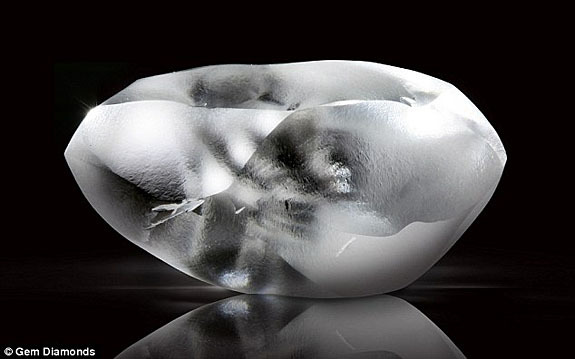 Recently, British mining company Gem Diamonds Ltd. revealed still another amazing find at Letšeng — a gem-quality rough diamond weighing in at 164 carats. Despite it being much smaller than its gigantic cousins — the 603-carat Lesotho Promise and the 550-carat Letšeng Star — the newest find was quickly scooped up for $9 million. Gem Diamonds Ltd. reported that the rough diamond was transported to Antwerp, where gem experts are determining its potential value as a faceted gemstone. In addition to computer analysis, they will be polishing a surface of the diamond to open a clear "window" into the center of the stone. Depending on what they find, the D-color, Type IIa rough could be divided to yield a number of flawless polished diamonds, or if it is internally flawless, it will likely be kept as one single stone. A flawless diamond of this size has the potential to break previous price records if and when it sells at auction. At 10,000 feet above sea level, Letšeng has the distinction of being the world’s highest diamond mine. 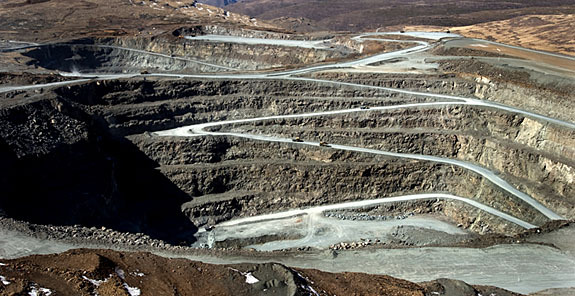 Gem Diamonds Ltd. has a 70% stake in the mine and The Kingdom of Lesotho owns 30%. Guests of the 7-star hotel that sits on a man-made island almost 250 meters off the Jumeirah coast can use their gilded iPads to take a tour of the hotel, order room service, make a restaurant reservation or get details about spa treatments and butler services. They can also sign into their iTunes account and download apps, games and music. A resort-wide wireless network is available for all users. 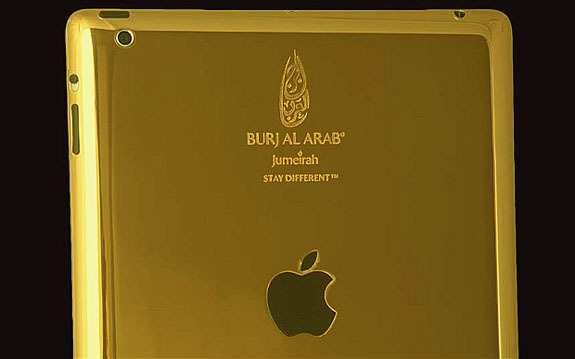 Hotel general manager Heinrich Morio commented: "Our exclusive Burj Al Arab 24-karat gold iPads epitomize Jumeirah’s philosophy of 'stay different' and further enhance our guests’ experiences during their stay." 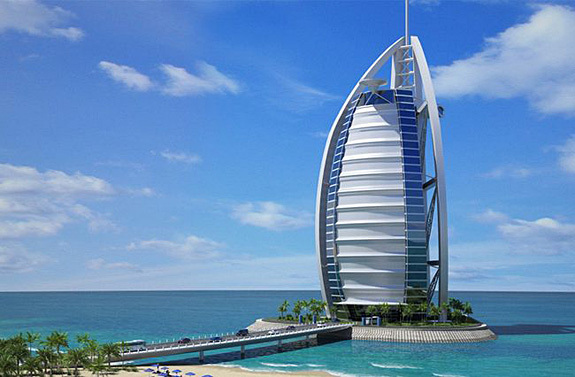 Just how luxurious is the Burj Al Arab? Guests who stay in the hotel’s $18,000-a-night Royal Suite enjoy 8,395 square feet of sheer luxury, including marble floors, mahogany furniture, Hermes toiletries, a private cinema and a rotating four-poster bed. They can also request a chauffeur-driver Rolls Royce or helicopter (at extra cost). 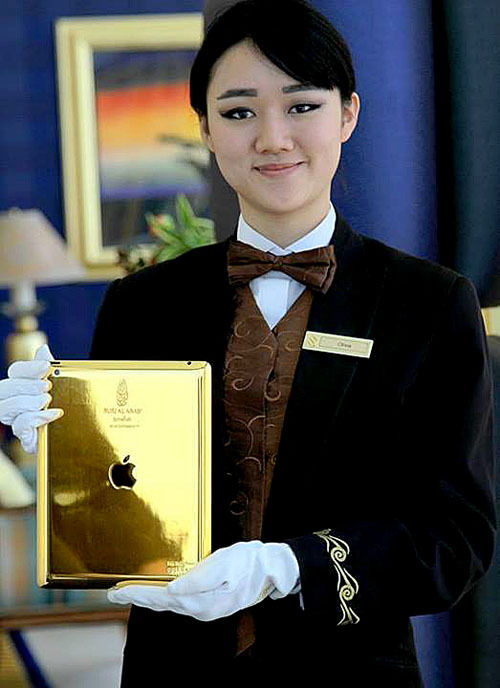 Although the opulent iPads will be given out on loan to hotel guests, the devices are available at the hotel boutique for $10,500. Welcome to Music Friday when we bring you exciting songs with jewelry, gemstones or precious metals in the lyrics or title. Today we feature “Gold,” the debut single from Nickelodeon star Victoria Justice. The song was released on iTunes this past Tuesday. Called the “perfect summer tune” by MTV Buzzworthy’s Byron Flitsch, “Gold” combines flirtatious, confident lyrics with an upbeat, carefree vibe. Justice told JustJaredJr.com that the song is about a girl trying to tell a guy that she’d like to be more than just friends. “I think it’s an empowering position for a girl to be taking because she’s putting it all out there,” she said. In the sassy refrain, Justice challenges her guy: “Hey, boy, watcha gonna do. If you want me like I want you. Then man up and make your move. I'm Gold, Gold." The 20-year-old Justice starred on the hit Nickelodeon series Victorious for three years. With this new single, she follows the lead of fellow Nickelodeon alumnae Ariana Grande and Miranda Cosgrove, who have launched successful musical careers after establishing huge fan bases on teen sitcoms. Enjoy the video at the end of this post. The lyrics are below if you'd like to sing along. Written by Tove Nilsson, Peter Thomas, Jason Weiss, Sam Shrieve, Ben Camp, Jakob Jerlström & Ludvig Söderberg. Performed by Victoria Justice. Do I really need to spell it out? You’re not a fool you see what I’m about, so by now I think you figured it out, I think you figured it out, I think you figured it out, I think ya! New research matching the geology of Mars with that of Australia’s Red Center sheds new light on why 95% of the Earth’s opals come from Down Under and how the Red Planet is likely a rich source of the colorful, fiery gemstone. “Before this, we did not know [opal's] origin, why it forms at such shallow depths or why it can be found in central Australia and almost nowhere else on Earth,” said lead researcher Professor Patrice Rey of the University of Sydney. Between 100 million and 97 million years ago, a vast sea that covered 60% of Australia began retreating. As the sea regressed, a rare episode of acidic weather was taking place, exposing pyrite minerals and releasing sulphuric acid. As the surface of the basin dried further and cracked, silica-rich gel became trapped in the veins of the rock. 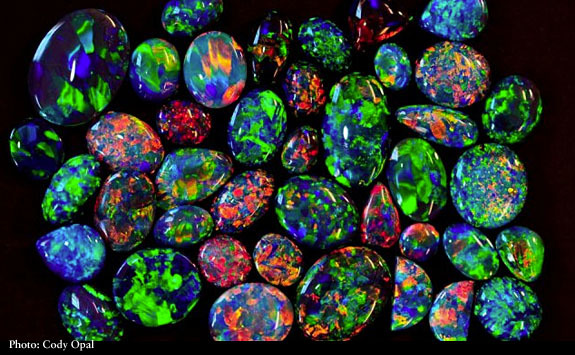 Over time, the silica solidified to form opals. Central Australia is believed to be the only place on Earth where acidic weathering of this scale has ever taken place. However, the same conditions were documented on the surface of Mars in 2008. 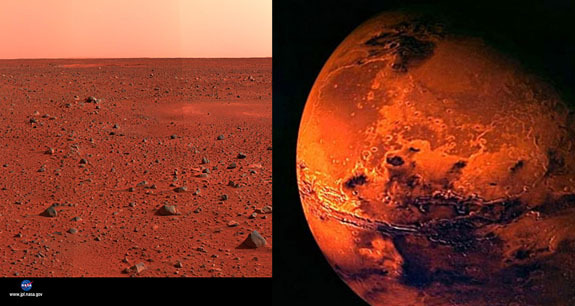 "If you look at Mars and the Red Center [of Australia], they share similar characteristics," said Patrice. "Similar rocks went through similar weathering processes, so potentially precious opals might exist there." Interestingly, Australia’s Red Center, an arid area known for its bright rust-colored soil, could easily be mistaken for an outpost of Mars. So far, only poor-quality opals have been identified on the surface of Mars. They were discovered in 2008 by NASA’s Mars Reconnaissance Orbiter using a spectroscope. The mystical medicinal properties of silver — widely used by ancient civilizations — are back in the headlines, as a new study reveals that tiny amounts of the element added to common antibiotics make the medications up to 1,000 times more effective in fighting infections. The lustrous fashion-forward precious metal could be the medical community's silver bullet in its battle against drug-resistant “superbugs” — bacteria that has grown immune to standard drugs. Some doctors have feared that superbugs, left unchecked, could make the most common surgeries extremely risky because the arsenal of effective antibiotics is nearly tapped out. The World Health Organization has warned that "many infectious diseases risk becoming untreatable and uncontrollable." Since the days of ancient Greece, silver has been cherished on so many levels — from fine jewelry and ornaments to currency and utensils. 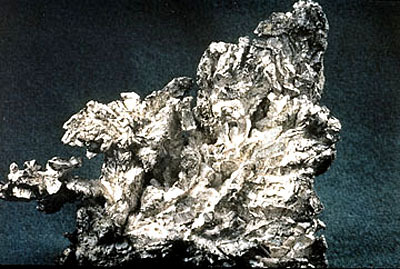 The ancients also discovered that silver had unique healing properties, such as protecting wounds from infection and preserving food and water. Privileged families in the Middle Ages benefited health-wise from using silver eating utensils even though the side effect was often a bluish-grey discoloration of the skin. These fortunate families became known as "blue bloods." 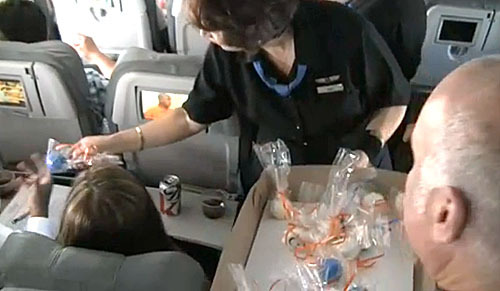 And North American pioneers routinely dropped silver coins into their drinks to ward off infection on long journeys. 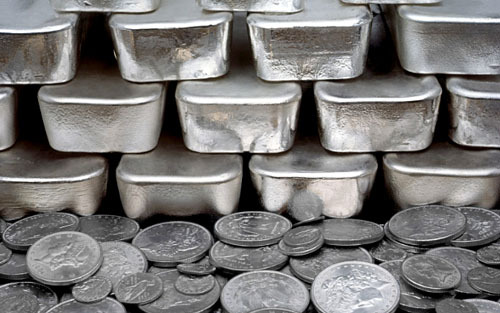 Silver’s place in the medical community continued all the way until the 1940s, when newly developed antibiotics were favored to fight sickness and infections. 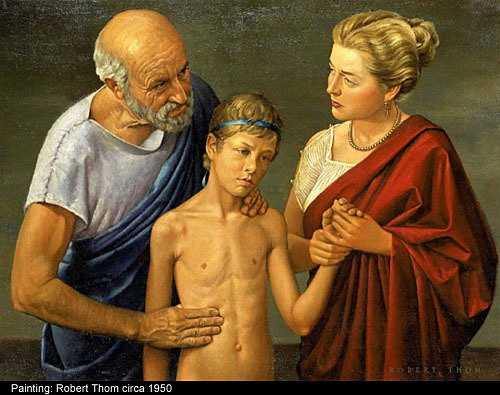 Now, 70 years later, the ascension of drug-resistant superbugs has scientists revisiting their old friend silver, the same element that the "Father of Medicine," Hippocrates, prescribed to treat ulcers in ancient Greece in 400 BC. In a study published in Science Translational Medicine, researchers at Boston University found that by adding trace amounts of silver to common antibiotics, the medications became up to 1,000 times more effective in fighting infections in mice. "We went from basically no killing to substantial killing," said senior author James Collins, a professor of microbiology. The silver attacks bacterial cells in two main ways: It makes the unusually tough cell membrane of superbugs more permeable, and it interferes with the cell’s metabolism. Both mechanisms could potentially be harnessed to make today’s antibiotics more effective against resistant bacteria, Collins said. Although the experiments have yet to be performed on humans, initial findings are more than promising. Holly Madison is living the dream. On Sunday, high atop the Ferris wheel at the Electronic Daisy Carnival in Las Vegas, the former Girls Next Door star received a jaw-dropping 18-carat yellow diamond engagement ring from her romantic long-time beau, Pasquale Rotella. 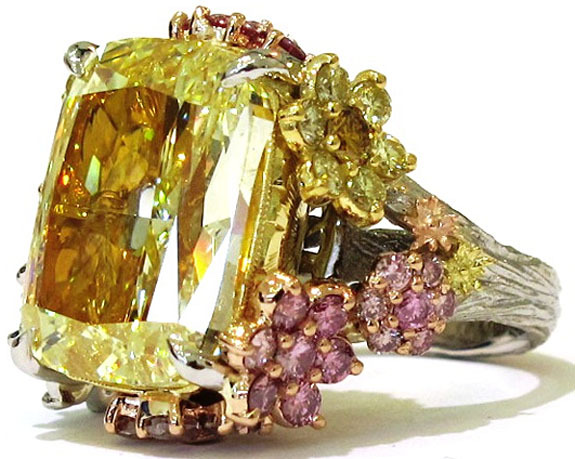 Designed by celebrity jeweler Alan Friedman with an assist from Rotella, the Art Nouveau-inspired engagement ring features a mammoth cushion-cut yellow diamond center stone surrounded by delicate florets of yellow and pink diamonds. Tiny golden leaves complement a white gold shank that has the texture of tree bark. "I couldn't have asked for a more wonderful or magical proposal!" Madison wrote in her blog. The 33-year-old former model starred with Hugh Hefner in the E! reality show The Girls Next Door from 2005 to 2009. Madison and Rotella have been dating since the fall of 2011 and the couple had their first child, Rainbow Aurora, in March of this year. Infatuated frontman Marty Roe sings about being crazy in love with his “unbelievable” new girlfriend. His life had been lonely and boring, but now an intelligent, elegant, heaven-set beauty has turned his world upside-down — so much so that he stutters when he tries to speak to her. Peppered with perfect harmonies, the fun, up-tempo “Unbelievable” vaulted to #2 on the Billboard Hot Country chart while capturing crossover fans, as well. The song settled in at #36 on the broader-based Billboard Hot 100 chart. 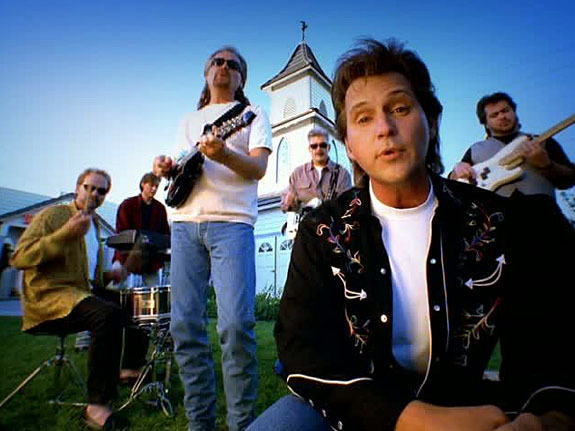 Diamond Rio was founded in Nashville in 1984 and is still comprised of the same six members — Gene Johnson, Jimmy Olander, Brian Prout, Dan Truman, Dana Williams and Roe. The group is a 13-time Grammy nominee and was voted the Country Music Association’s Vocal Group of the Year four times in the 1990s.